If you thought humans were the only clientele at New York restaurants, think again. Rats are as commonplace in New York City as yellow cabs, halal food trucks, and ‘post no bills’ signs. Hell, Animal Planet even named the Big Apple the worst city for rats in the world. 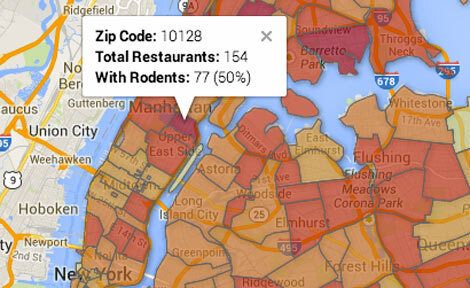 This new interactive Google map unleashed by Gothamist shows rats are also dining alongside us in restaurants. To create the rat map, programmer Steven Melendez gathered data from the Department of Health and looked at all the inspections that have been done since January 1st, 2013. From the data, he counted the total number of inspected restaurants as well as the number of restaurants that received violations for evidence of mice or rats during the time period across each zip code. For each zip code, he also added restaurants that currently have C grades and were cited for mice or rats in the most recent graded inspection. 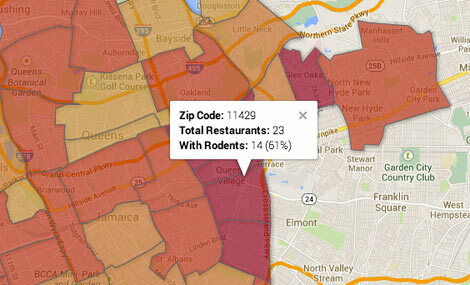 The Queens Village/Bellaire section of the borough came in first place with a shocking 61% restaurants containing rats. In the 10128 zip of the Upper East Side, 77 out of 154 (50%) of the area’s restaurants were cited for rodent infestation. Roosevelt Island escaped shameful statistics by coming out as one of the very few critter-free neighborhood. Jeez. And we thought Ratatouille was just a fictional children’s movie.